Taking this picture felt, in some ways, like the culmination of so many thing I have learned about photography over the years. From composing the shot to controlling the exposure to postprocessing…and even just seeing the photo opportunity in the first place, it all sort of coalesced into the picture you see here. I hope you don’t mind me saying that I quite like it and, at the risk of sounding a bit self-aggrandizing, I think it’s one of the better macro-style shots I have taken in a while. So here’s kind of the play-by-play of how this shot came about. I was walking across campus one afternoon recently, following some light spring showers that had blanketed the city in a warm mist earlier in the day, and saw this tiny little…something. 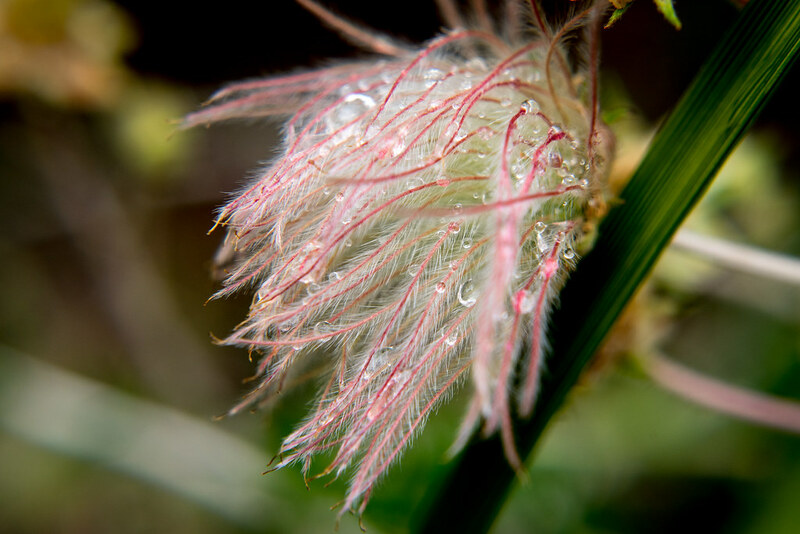 You all know by now that I’m no botanist and have little to no clue about what various plants actually are, but this thing was about the size of a quarter and I thought it looked so pretty, and delicate, with beads of water clinging to those fine white-and-red strands. Thankfully I had my D750, 50mm lens, and my usual set of close-up filters handy though I should let you know that I actually walked right on past this thing at first because I didn’t think it would really be worth photographing. I’m sure glad I was wrong. I took one shot with my +4 filter and immediately realized I would need my +10, so I put that on and took a few shots at f/8. I didn’t bother with anything wider since I knew (after a lot of trial and error which has been well documented here on the blog) that f/8 would make sure much of the subject would be in focus while still getting a nice amount of background blur and also result in a sharper picture overall. The only real question was the angle at which I was shooting, and I moved my camera around a bit to get a couple of different viewpoints but in the end I only spent about two minutes on this shot before moving on, confident that I had something I would like. Sure enough, when I loaded the images in Lightroom I found that I was perfectly pleased with most of them, so then it came down to a matter of personal preference. What ultimately did it for me on this particular shot was how sharp it turned out. If you click on the image and zoom in to 100% on Flickr you will notice that even the smallest wisps in the middle of the image are extraordinarily sharp, which doesn’t often happen when I do close-up shots like this. Of course there are plenty of strands that are not sharp due to the shallow depth of field (even at f/8) but right in the middle, where I hope the viewer’s eyes are drawn, is precisely what I was hoping it would be. And so there you have it: a reason to keep practicing, trying new things, and taking pictures even when you don’t think you have anything around you worth photographing. Pause a moment and look at the world around you, and you just might find yourself in the presence of something beautiful.